This section provides some general information on domestic on-site wastewater systems but the principles apply to any wastewater treatment and land application system. While local and state regulations and guidelines may vary with respect to sizing of treatment systems and restrictions on the disposal of the effluent, the primary concern is for the maintenance of a healthy environment. The information here is intended to be general in nature without resorting to highly technical discussion, such information is available elsewhere - see under "publications". Concentration or load? Which system to install? It is important to consider that almost all the products you buy, will at some stage end up in the wastewater system, either as a residual of use, or degraded by consumption. Just picture all the products in your local supermarket, pharmacy, green grocers, beer, wine and spirits shops and local takeaways - at some stage everything in there will end up in a sewer somewhere, except, of course the containers and wrappings.. In the toilet, the remains of your meals together with metabolic breakdown chemicals (bits and pieces of you), will be combined with paper, toilet cleansing products, and water to be flushed away into the treatment system. What anti-biotics have you taken recently that may disrupt the effective working of the anaerobic bacteria in the septic tank? Have you recently returned from overseas, bringing with you bacteria and viruses from those foreign lands and excreting them into your septic tank or sewer? What residual effect may they have? In the kitchen, the discarded remnants of food preparation and cleaning, together with oils and greases, dishwashing detergents and other chemicals provide both a solid and liquid load to the treatment system. Bacteria from decomposing meats and decaying vegetables will be discharged as you wash implements. Removing as much of the solids by using an inexpensive sink strainer, scraping plates before washing and separating oils and greases for recycling - or addition to the compost heap, will reduce the load of nitrogen products from the wastewater. In today's modern kitchen, greases and lards that solidify at ambient temperature have been replaced by vegetable oils that remain liquid at room temperature and their removal in grease traps is incomplete. And how much of you is flushed down the shower each day - skin, sweat, hair, body bacteria - that makes even clean looking water highly contaminated. The toothpaste, hair gels, personal deodorants, talcum powder, body creams, hair dyes and heaps of other "personal products" are just some of the mix. You could call it a "soup' and bits of you are part of it! The laundry components have been well documented and discussed under the vast material on this website. Suffice to say that there are many products that make the task of disposing of the effluent to a soil environment very difficult. Many laundry and cleaning products should be banned because of their potential environmental impact. But that would require positive government interactions against multi-nationals! When the treatment system consists of an on-site septic tank, or aerated wastewater treatment system (AWTS), then the consequences of those solid and chemical additions may interfere with the settling in the primary tank, as will be discussed below. Perhaps the most severe impact of the effluent is upon the structural stability and permeability of the soil in the land application area. While the kitchen contributes only a small proportion of the wastewater generated by a single household, it is generally the load of easily removed solids that cause the greatest impediment to treatment and disposal. The solids would be better removed and composted as a process of recycling the valuable nutrients. Unfortunately, many of the guidelines for domestic wastewater treatment and disposal rely upon calculating the nutrient loading to soils based upon a volumetric output from the home (water measured in litres per day). However, it is the load of contaminants that needs to be assessed at each of the four generation points, that is, load is calculated by mass of contaminant (milligrams per litre) multiplied by the volume of water (litres). The contaminants - those products and their respective by-products that we have added to the water, may actually be of some positive environmental value, or they may be products with which we would prefer not to have to treat. We need to consider three components of wastewater: (1) the water; (2) the organics, including bacteria, parasite and worms; and (3) the inorganics. 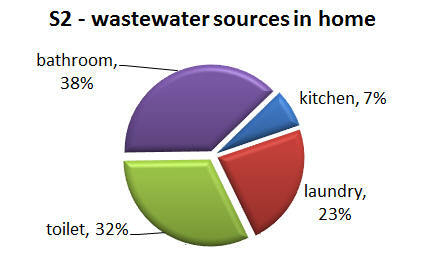 The contribution of each wastewater source in the home is generalised in Figure S-2. Note: we refer to the combination of all the discharges from the house, prior to any treatment as 'wastewater'. After treatment that liquid stream is called 'effluent'. How we calculate daily wastewater discharges and the respective nutrient and hydraulic loadings on the environment is subject to several methods of calculation. 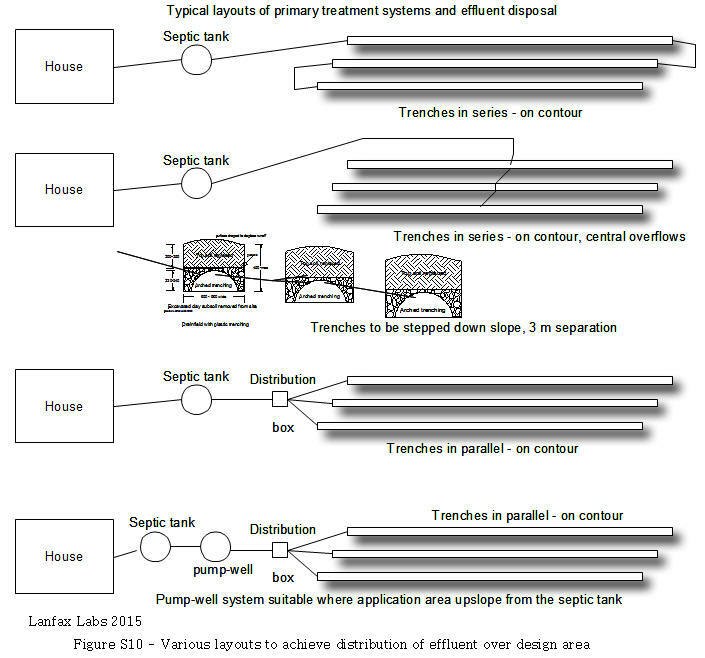 The outcomes can either over-estimate or under-estimate the potential impact without assessing the risk, imposing poor treatment through incorrectly sized septic tanks (too large as well as too small), or land application areas that are too large or too small (hydraulically overloaded or hydraulically underloaded). Let's take an example as set out in Table S1 where we have two households in the same rural residential estate. Using the method of calculating daily load based as required by many state agencies, it is easy to show how nonsense creeps into the daily assessment. What we need to see from the comparison of the two households is that House 1 has modern water conservation fixtures while House 2 has the fixturea that may have been fitted 20+ years ago. Certainly the difference in annual water use is significant, House 2 requiring a larger land area to adequately discharge the 263 kL - the hydraulic load.. The problem I have with the calculation of total nitrogen (TN) and total phosphorus (TP) load is that those nutrients are derived from specific sources in the home and water use is not the determining factor. We assume that the occupants of House 1 eat about the same type of foods and amount of food as House 2. That's fairly likely. But the nitrogen load comes mostly from food consumed - bits washed down the kitchen sink and the 'used' food that ends up in the toilet as faeces and urine. From Table S1 it would appear that House 2 eats 64% more than House 1, otherwise how would they produce that much more total nitrogen. The TN does not come from the water, nor from laundry or bathing products (except in minute amounts), it comes mostly from the food. Similarly for phosphorus, the source being food and laundry detergents. When you refer to the laundry section of this website, you will see that you can choose laundry detergents that have very little to no phosphorus. However, the specialist products for front loaders are generally higher in phosphorus than those for top loaders. So, what does Table S1 mean? Simply that the occupants of House 2 eat 64% more than House 1. We know that is an unlikely probability because the variable was water volume. The method of using wastewater volume to determine nutrient loading on the land application area is flawed - seriously flawed. From research data on the typical concentration of primary treated septic tank effluent, we can choose 70 mg N/L and 10 mg P/L as typical values. House 1 TN and TP loads are, therefore, more likely to be the norm. What we then need to do is to calculate the per person load of TN and TP on an annual basis. From House 1 values that would be 2.8 kg N/person.year and 0.4 kg TP per person.year as realistic so that these can then applied to the number of persons expected to reside in the house, not the volume of water that is used by the assumed number of persons. When Regulations and guidelines vary the typical daily water use (litres per person per day), as occurs from state to state, these changes do not correspond to a different diet, as they would if we used the examples in Table S1. The annual loads for total nitrogen and total phosphorus are the measures that are more likely to represent actual nutrient loading of the land application area and allow the design to appropriately size the application area to avoid off-site effects. MY CONCERN: It is just TOO simple for regulators to be working in volumes when there are reliable data on typical concentration ranges for nitrogen and phosphorus from which more accurate land assimilation areas can be calculated. Table S1 shows the nonsense of using only volumetric assessment. Unfortunately, don't hold your breath for regulators to come into the real world! Domestic wastewater, as we discussed above, is a liquid composition of water (of various quality - town water, rainwater, bore water), solids, chemicals, oils and greases, bacteria, minerals (sand, soil, bone). The composition varies throughout the day and from day-to-day because of normal household activity. 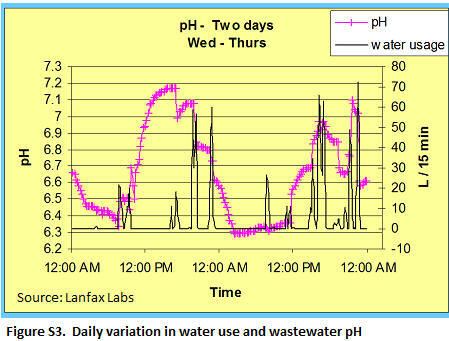 Figure S3 indicates the variation in water use and pH of the wastewater over a typical two day period - washing, showering and daily meal times included. What the variation is at any time of the day is guesswork, unless accurately measured, so most wastewater planning is performed on daily or annual averages. These averages, may or may not truly reflect the individual household, or even a population average..
COLLECTION: The wastewater generated from each of the fixtures in the house (toilet, hand basin, shower, bath, kitchen, laundry) is directed through a wastewater pipe to the primary treatment tank. Here all the liquid and solids wastes are mixed together in a water-tight container of about 2000 L capacity (or larger). PRIMARY TREATMENT: The mixed wastewater undergoes some turbulence when it first enters the tank, breaking up solids (faeces and paper). Provided the tank has been sized correctly, the liquid will undergo periods of settling before the next slug of wastewater arrives. During that quiet period, solids that are less dense than water (greases, oils and fats and those buoyed by gases) float to the surface where they form part of a scum over the whole surface of the liquid. This floating scum is an essential part of the treatment process because it excludes the free transfer of air (oxygen) at the water surface and the liquid digestion quickly consumes all the oxygen and anaerobic bacteria (live in the absence of oxygen) degrade the organic components. Other solids that are more dense than water (bone, sand, soil, heavy faecal material) settle to the bottom as sludge. The anaerobic bacteria produce gases (methane, ammonia, other complex gases) that give the septic tank a musty odour. Be aware, gas emissions from septic tanks are explosive and poisonous. Thus the primary treatment processes are particle separation, settling, suspension and floating, and anaerobic decomposition. SECONDARY TREATMENT: After primary treatment, the primary effluent passes to a second tank where air is added to the primary effluent to favour aerobic bacteria (require oxygen) that further degrade the organics through an oxidation process. In a septic tank system, this secondary treatment takes place our in the soil environment. Engineered systems like the aerated wastewater treatment systems (AWTS) deliver air, in the form of bubbles, into the effluent that flows over from the first chamber (primary treatment) into the aeration chamber (secondary treatment). At this stage, the aerobic bacteria are about ten times more effective in degrading the organics, turning solids in soluble products while producing only carbon dioxide and water as by-products of that respiration. AWTS, therefore, have no smell - when they are working correctly. In an AWTS, chlorination may be added after the secondary effluent passes to the clarification tank. Additional engineered systems for tertiary treatment are usually too expensive and difficult to manage for the single domestic wastewater system. Thus tertiary treatment takes place in the soil environment, delivered either by surface spray application, surface drippers or sub-surface drippers. Within the soil, chemical, physical and biological processes further degrade the effluent until mostly only salts, plant nutrients, water and an enhanced biological environment exists. Pathogens (harmful bacteria and viruses) are immobilised close to the application area where they are either consumed by other bacteria or die in a hostile environment (air, dehydration). The purpose of domestic wastewater management is to return the water to the hydrologic cycle and render the chemical components either harmless or beneficial to plants and soil organisms. Before confusion sets in, we need to be clear about the separation of wastewater into two components: blackwater and greywater. As set out in Figure S1, blackwater consists of the combination of toilet wastewater and that from the kitchen. While it is obvious why the toilet water may be highly contaminated, the understanding of kitchen wastewater has more to do with the solids, greases, oils and harsh chemicals (automatic dishwashing detergents) in both hot and cold water. These contaminants are likely to block filters or provide attractants to vermin (rats, mice, flies), hence disposing of them in the septic tank is most appropriate for public and environmental health. Greywater, from the bathroom and the laundry, may be contaminated by bacteria (present in faecal matter) as well as chemicals and solids. Pre-filtering may remove the larger lumps and allow dispersal through an irrigation system. Unlike the American context of 'bathroom' which is actually the 'toilet' in Australian usage, the bathroom simply means shower, bath and handbasin and definitely DOES NOT include the toilet. For over a quarter of a million homes in Australia, the lack of a municipal sewer connection doesn't mean that appropriate health controls of human and domestic wastes cannot be effective in minimising pollution and avoiding off-site health impacts. In NSW, the regulations are quite clear as to the performance criteria that will be enforced by local councils when inspecting on-site systems (see NSW Local Government (General) Regulations 2005). Unfortunately the NSW legislation uses the term 'prevent' when referring to those potential impacts. While it is best practice to design a system to minimise health and environmental risk, it is not possible to 'prevent'. Even hospital systems cannot prevent disease and infection. Similar on-site wastewater legislation in other states (see relevant state Health or EPA websites)reflects the long held view that human waste is a potential source of wider health and environmental risks. Minimising those risks is the key to effective and economic on-site treatment systems. The sustainable reuse of the water and nutrients may also be considered relevant, although the primary task is to negate potential health and environmental consequences of treatment and land application. I work to develop design that incorporate beneficial use, as the system will be better managed and maintained than one that simply discharges wastes 'out-of-sight' for the cheapest option. Mind you, the most expensive option may not be the most reliable and energy efficient. So what systems are available for on-site domestic wastewater treatment? Well, any device or process that can treat human wastes to meet the performance criteria to minimise health or environment risk to either the occupiers or neighbours is appropriate. A simple "long drop" (pit latrine) may be all that is required for a church hall where a small community meets once a week, or a highly engineered system may be required for a community housing estate on the unsewered fringes of a major city. Many examples exist of housing estates where the residents have a 'community title' to a packaged treatment system and the community owns, manages and operates the scheme to meet the licensed conditions. For systems over 20 persons equivalent, licensing by a government agency is required and on-going monitoring and conformance are stipulated in the licence. For single systems, the local authority usually provides a 'licence to operate an on-site sewage treatment system', although in Victoria, the Environment Protection Agency (VicEPA) is the sole responsible agency. Other agencies, such as Health Departments may be involved. The sections below are by no means comprehensive. Between 1999 and 2007, Lanfax Labs coordinated five three-day conferences on On-site Systems at which more than 250 professional papers and keynote addresses covered a variety of topics from compost toilets to engineered systems. The tables of contents for each of those conferences can be viewed under 'publications' in other parts of this website..
Now for some of the simple detail for on-site systems. Note that when doing a word search on the internet, the Americans avoid the hyphen and refer to 'onsite' as a whole word. The Australian Macquarie Dictionary refers to 'on-site' as the preferred usage, although Victoria follows the American usage, making searching for Australian research a little more tedious. I should clear up my understanding of the words 'dispose' and 'disposal'. Some politically correct people think that 'disposal' is not appropriate and 'dispersal' includes the re-use of effluent for irrigation. So be it! I will use 'disposal' to also include re-use because whether we like it or not, our aim is to get rid of the water through the hydrologic cycle - mostly as evapotranspiration - and that is disposal. That we also include growing of plants doesn't negate the fact that we want to get rid of the water and its contaminants as safely as we can - that's disposal. Figure S4 shows the essential elements of an on-site wastewater management system (OWMS). Yes, the tennis court and garage are important parts because they prevent those areas being used for effluent disposal. The house: generation of wastes from toilet (faecal, paper, urine, water), kitchen (greases, oils, food scraps, salts, detergents, soluble nutrients, hot and cold water), the bathroom and basin (body oils, bacteria, hair, personal care items, detergents, soaps, cremes) and the laundry (lint, detergents, mineral soil, greases). The water system may also provide salts, trace elements (including zinc and copper, chromium, nickel, lead) while bore water may also contain other minerals. The occupants are responsible for the volume of water generated as wastewater and all the chemicals and physical additions to the water from activities within the home. Water conservation and chemical minimisation are the joint responsibility of all the occupants. Water traps: all the devices connected to the wastewater will have a 'water trap' ('S' bend, 'P' bend) to prevent the return of gases from the waste pipes returning into the home. Septic tank: a primary treatment system that operates in an anaerobic mode, that is with anaerobic bacteria that operate in an oxygen free environment. The septic tank provides a storage component during which period solids more dense than water settle to the bottom and light materials float to the surface to form a scum. Other treatment systems, such as aerated wastewater treatment systems may be required to upgrade the treatment process. A dry system, such as a compost toilet or deep pit latrine ('long drop') can treat human wastes but may be less efficient at handling high urine loads. Land application area: an area of land within the confines of the property boundaries in which the discharge from the septic tank is spread in such a manner that the water and its dissolved and suspended solids are absorbed into the soil profile for final treatment. The nutrients are absorbed by the vegetation or retained in the soil, the water drains slowly downwards and sideways under capillary flow and upwards to evaporate into the atmosphere. The harmful bacteria (pathogens) are destroyed within the soil by many processes. Whether the land application system is through a series of trenches, by surface or subsurface irrigation or by evapotranspiration beds is a matter for the individual system based upon land constraints (these will be discussed further).. The surface of the land application area must be protected from traffic (vehicle, animals and humans) as compaction when wet will impede the effective movement of water. Some areas may require diversion of potential run-on water away to other areas. Property boundary: All wastewater treatment must occur within the property boundary and no liquid should enter the neighbouring lands or waterways, either over the surface or by sub-surface flow (that includes soggy areas through into the neighbour's property..
Wastewater enters the septic tank from the left and flows below the scum layer that develops on the surface. The 'T" piece ensures that the inflowing waste enters below the surface. The wastewater (liquid with entrained solids) mixes with the liquid contents of the tank, the more dense particles settle to the bottom and the lighter particles float to the surface to become part of the surface scum seal. This scum on the surface is the most important part of the operation, as it excludes air from the liquid, allowing the anaerobic bacteria to thrive. In some areas, home owners are 'conned' by pump-out contractors into believing the tank is 'full' when there is a scum on the surface and hand over many dollars to have the tank evacuated unnecessarily. An effective septic tank will generally only require pump-out every three to seven years, depending upon vigilance of what goes into the system. While held in the tank, the solids may separate into small parts (big lumps become small lumps), and some very small particles (colloids) may clump together and settle to the bottom, while other particles will stay suspended for long periods. For this reason, the volume of water in the tank should be at least the 24 hour volume of wastewater generation, after allowing for maximum sludge and scum formation. The liquid portion is made up of water, dissolved components and suspended materials that don't have sufficient mass for their volume to sink, or light enough to float. Bacteria may start to decompose any of these three components (scum, liquid, sludge). Anaerobic bacteria live in this environment where oxygen is a poison. The oxygen that enters with the wastewater is quickly consumed and overall, the dissolved oxygen level will be close to zero. The discharge will, therefore, be anaerobic in which ammonia, hydrogen sulphide (rotten egg gas), methane and other putrid smell are common dissolved gases. Be aware! These gases are poisonous and some are explosive. So, the big question is - Should a septic tank smell? While there are many obnoxious and harmful gases in an anaerobic septic tank, the scum layer usually minimises their release to the atmosphere, so where a solid, dry scum layer forms, the smells will be minor. When the scum layer is watery, broken or fails to form, smells will always be more noticeable. A baffle may be used to form two compartments in the one tank, the first chamber being about 2/3 total volume and the second chamber the remaining 1/3. The baffle has holes below the scum layer to allow waste to pass slowly through from the first to the second chamber. The outlet is in the second chamber where the wastewater has been partly clarified. It is still very dirty water, smelly and with large populations of hundreds of species of bacteria, as well as viruses and parasites. Primary treatment does little to reduce the contaminated nature of the water. It is certainly not clean enough to swim in, and the thought of drinking it is revolting! Yuk! Over years, the scum will accumulate to the point where, if allowed to continue, would be deep enough to overflow through the outlet. Similarly, if the sludge accumulates too much, it may be sucked out with the discharge. The primary tank is designed to limit the discharge to within reasonable limits. Therefore, at some time the septic tank will have to be de-sludged depending upon the rate of build-up of scum and sludge. Don't be conned by those who see the scum as a sign of the tank being full. Conversely, don't listen to those who say an efficiently operating septic tank never requires a pump-out - at some stage they will need to be evacuated and start again. Typical discharge from the septic tank, now call effluent (because it has been through a treatment process) rather than wastewater (untreated), has about 50-200 mg/L total suspended solids (TSS), pH about 7.0-7.5, electrical conductivity (EC) about 0.7 -1.5 dS/m, biochemical oxygen demand (BOD5) of around 250 mg/L and bacteria many times more than 100 000 colony forming units per 100 mL (cfu/100 mL). Because we cannot see bacteria without very strong microscopes, some bacteria are cultured under special conditions until they form colonies that are visible as dots on a filter. These colonies can be counted and reported as cfu/100 mL. Many thousands of species of bacteria live in a septic tank, but we only culture faecal coliforms because they are representative of the species that live in the gut of warm-blooded animals. A septic tank is a biodegradation device that operates in a passive way; wastewater in equals effluent out without any external energy input. 1. Primary treatment vessel must be a big tank that holds more wastewater than is generated in one day. The tank must be water-tight and resistant to chemical attach. 2. The tank operates passively in an anaerobic state, producing smelly gases even under ideal conditions. 3. The surface scum is essential to keep the contents anaerobic and to minimise the escape of smelly gases. 4. After a period (perhaps 3-7 years) the tank will need to be pumped out to remove the accumulated sludge and scum. 5. Anti-bacterial products used in the home may be detrimental to the bacteria in the tank - those bacteria that are helping to do some primary treatment. 6. The discharge requires further treatment and needs to be kept away from humans, animals and the wider environment. WARNING: Everything you put down the sink, toilet, shower or laundry will end up in the septic tank and harsh chemicals may seriously reduce the capacity of the primary treatment system or worse - render the discharge unsuitable for on-site application. Septic tanks can operate on sea-water, so salts from detergents and soaps are unlikely to affect the operation of the tank, but high salinity levels may impinge upon the ability of the soil to adequately move the water through the soil for its final treatment. Irrespective of advertising by manufacturers of detergents, toilet paper and other household chemicals, there is no guideline or standard in any state of Australia for septic safe products. Manufacturers who label products as "safe in septic" are trying to 'pull the wool over your eyes'. It may be safe in the septic but it may be disastrous to the soil - so your system will fail if it cannot effectively deal with the water and nutrients in the land application area. For many on-site systems, the septic tank is the end of the engineered treatment system with the effluent discharged to drainfields in the land application area. Unfortunately, many home owners think that the septic is the end of the matter. Septic tanks are simple treatment devices - so simple they can hardly go wrong. But the soil is the most complex biological system on earth. The interface where living and non-living components live. So if the soil system fails, your on-site wastewater management system has failed, and a simple solution such as pumping out the septic tank will NOT solve the problem. In some situations, where the discharge of primary treated effluent to the soil would require large land application areas, or where the subsoil is unsuitable for disposal of effluent, it may be necessary to take the next step in the effluent clean-up through another engineered device, such as an aeration device, a wetland, a sand filter or peat biofilter. Secondary treatment removes more of the total suspended solids (TSS), reduces the biochemical oxygen demand (BOD) and eliminates a large proportion of the bacteria. Some secondary treatment system claim much more, but under real conditions few meet those goals. The secondary process involves the provision of a medium for entrapping suspended solids (reducing the time it takes for solids to settle onto a firm surface) and convert the environment from anaerobic (without oxygen) to aerobic (with oxygen) because aerobes operate 10 times faster than anaerobes and the by-products of degradation are carbon dioxide and water. These two processes reduce the total suspended solids and the biochemical oxygen demand, and convert ammonia to nitrate as well as eliminating other odours. Process 1: Fill the receiving chamber with a honey-comb medium that provides surfaces on which solids may settle. Many different plastic products are used, some of which have very large surface area to volume ratios, up to 300 square metres per cubic metre. Process 2: Use an electrical-mechanical device to pump oxygen into a diffusing system to provide very small air bubbles over the honey-comb medium (inject in the bottom). The smaller the bubbles, the more bubble surface area to volume ratio, hence the greater oxidising ability. 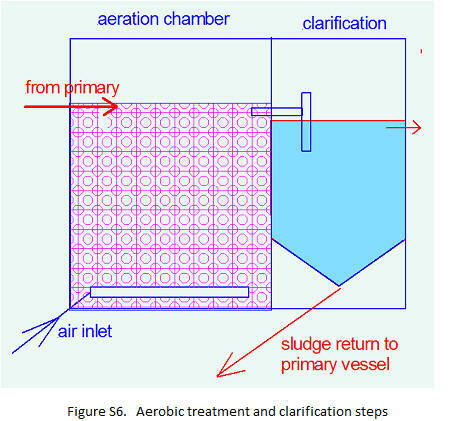 Process 3: Pass the aerated effluent into a clarification chamber where solid particles may flocculate and settle by suspension. Pass clarified liquid to irrigation tank, return sludge to primary tank (septic tank). Process 4: Capture the clarified liquid in another chamber from which it can be irrigated. Between Processes 3 and 4 there may be a disinfection stage. Effluent passes over tablets that release chlorine into the effluent stream, thereby killing some of the bacteria and leaving a residual dose of chlorine. This residual dose can be measured and reported. Be AWARE!. Chlorine also kills friendly bacteria in the soil. While Health Officials feel comfortable with the use of chlorine, it does not kill all parasites and bacteria species - just some. A typical aerated wastewater treatment system is sold as a single tank system (primary, aeration, clarification, disinfection and irrigation chamber) all in one tank, or as a two tank system where the primary tank is a separate tank and the other chambers are incorporated into the second tank. Provided allowance is made for a more regular pump-out of the primary chamber to remove scum and sludge, a single tank system may be adequate. However, a two tank system will permit higher loadings of the primary tank as there will be greater volume to store the scum and sludge between pump-out events. Most AWTSs are designed for a 10 person household and perform better when loaded evenly on a daily basis. AWTS for a two or three person household are usually under-loaded with a lower performance outcome. AWTSs are not really suitable for holiday or week-end shacks where they may be heavily loaded on Friday evening, Saturday and part of Sunday, and then not receive any inputs until the next weekend or holiday period. AWTSs consume about 100 W every hour of the day (aeration pump operates continuously) and then other power for irrigation pumping (depends upon volume and pressure head). Assume that a 750 W water pump can irrigate 100L/minute, a four person household generating 600 L/day would consume 30 kW. Thus, one needs to consider 876 kW for aeration plus 30 kW irrigation pumping when considering the annual cost of running a typical AWTS. In many states, local authorities mandate the three-monthly testing of an AWTS by an appropriately trained plumber, with a copy of the report submitted to the authority. Such impositions incur additional costs on the homeowners and add to the annual running costs. The choice of the most appropriate system will be made after a site and soil inspection has been conducted and the water balance modelled on the likely daily wastewater production. However, the system design may first consider whether a passive or active system is appropriate. Passive systems operate without consumption of power, wastewater and effluent flowing under gravity, or by incorporating an automatic siphon into the design. A typical passive system is a septic tank (primary treatment) overflowing into a subsoil rubble drain (drainfield) from where it percolates through the soil (drains away) and transpires to the atmosphere (evapotranspiration). Nutrients are taken up by plants and bacteria die-off in unsaturated conditions. An evapotranspiration bed may replace the subsoil drainfield under certain climatic conditions. A siphon may be used to pressure load a wetland or an evapotranspiration bed. These systems do not require any power and operate continuously unaided by human intervention. Dry compost systems may be passive, particularly where an exhaust fan is driven by normal wind conditions. The wastewater from the house then needs to be considered for an active or a passive system. Active systems require either electrical or mechanical energy inputs to drive aerators and pumps. AWTSs are active systems as described above. While solar power may be used to drive some of the processes during daylight hours, most system would revert to anaerobic conditions during the night and complicate the biological process. Under extended power blackouts, or where pumps have failed, AWTSs usually have very little capacity to continue providing adequate wastewater treatment. Immediate repairs are essential, particularly if the aerator has failed and the irrigation system continues to pump poorly treated effluent to a subsurface irrigation field - clogged drippers render the system useless. My preference is always for the system that will use the least energy and require the least intervention by homeowners, provided the land application system is appropriate to the site and soil conditions. In the first instance, I will always examine the passive system. Only when site and soil conditions are limiting will I examine active systems. In NSW the authorities may accept any system that meets the performance principles (appropriately designed and managed), unless a building covenant demands a particular approach. Many on-site systems fail in the land application area without the knowledge of the home occupier because it happens away from the house, often in an area unused by the family, left overgrown, or ignored because its always wet under foot. Many home owners do not even know where the land application area is located, whether it is one or a series of trenches, how long the trenches are and whether the effluent is actually treated in the soil or simply bubbles out at the surface. So should we know? And the answer is YES!. Even though, at some stage in the past, an application was made with your local council to install the system and they had to check it before the trenches were infilled (in NSW this was the law as far back as 1950), don't expect the council will still have any plans. The new laws pass all responsibility to the land owner. So there is a need-to-know! The land application area is the final treatment mechanism for on-site wastewater management. Here the system will be judged as a success or a failure. An over-filled septic tank with blocked outlets is easily rectified with a pump-out, but a failure in the land application area can be much more expensive to fix. The first principle is to identify the type of land application system and then seek to understand whether the soil is adequately treating the effluent. Is the method of disposal through one or a series of trenches? How are the trenches loaded with effluent? Are the trenches along the contour? Are there wet spots along the trenches? Is the application method subsurface irrigation? So let's look at some of the traditional disposal methods in the next sections. Trenches are constructed using a back-hoe, fitted with a corrugated half-circular plastic arch, backfilled with gravel and finished with surface soil. The figure below shows the cross-section of such a trench. It is important that the trench is shallow rather than deep to encourage the movement of water up to the root zone from where it is lost by evapotranspiration by the plants and soil. Because many Australian soil profiles have clay subsoils, it is important to avoid these clays because they have very low permeability resulting in very long trenches, or a series of many shorter trenches. Note that the arched trenching is backfilled with gravel and covered with a geotextile membrane prior to backfilling with top soil. During excavation, the subsoil (clay) needs to be separated from the topsoil and not reused in the trench. The clay may be used to construct a small bank upslope of the trench to direct runoff away from the land application area. The benefit of the trench system is that it is passive - requires no energy and very little maintenance over decades, other than mowing the grass on the surface. The top of the trench is shaped to displace rainfall and will need to be reshaped after the soil has consolidated months after completion. Sow the surface with a locally suitable lawn mix. Do not plant trees on the trench, but trees and shrubs can be place away from the edges of the trench. Do not grow vegetable over the top of the trenches. In rural and semi-rural areas, a fence may be required around the land application area to prevent stock bogging the area after rainfall when the soil will be wetter than the surrounding area. If depressions occur in the top of the trench, backfill these until the soil has a mounded shape and ponding of water does not occur. Trenches are constructed along the contour (parallel to the contour) so that water will form at equal depth along the length of the trench. In some areas, arched trenching is unsuitable because the wet soil cannot support the load bearing edges of the arch. In these area, the arch trenching is replaced by slotted pipe that will distribute the water throughout the trench as shown in the figure below. The same principles apply as outlined above. Where the calculated length of trench exceeds 25 m, it is preferable to construct several trenches, each not more than 20-25 m long, either in series (one overflowing to the next) or in parallel (each loaded together from a distribution box). The trenches are stepped down the contour so that each trench is parallel to the contour. It is important that the trenches suit the topography rather than be neatly set out parallel to each other. The benefit of the parallel trench layout is that each trench operates with a proportion of the effluent through the distribution box. However, the distribution box needs to be accurately sited and levelled and its performance regularly checked and the distribution reset if required. In a series layout, the first trench is always wet and only when one trench is saturated will it overflow (through a pipe) to the next trench and so on through the series. The least work is done by the bottom trench. Trenches fail for many reasons, not the least is a high solids carry-over from an overloaded septic tank. Incorrectly sizing the drainfield according to the long term permeability of the soil, the loading rate and local climatic variables may all contribute to trench failure. In many cases, adding an extra trench to the system may suffice. It is usually uneconomic to dig up a failed trench to rebuild it, because the failure is in the soil around the trench and not in the trench itself. Construct new trenches elsewhere. Surface irrigation of effluent from a primary treatment system is hazardous because of the extremely high faecal bacteria and potential pathogens in human sewage, not that human sewage is any worse than animal faecal material, it's just that primary discharge is also septic and specifically human. Secondary treatment systems usually include a disinfection step between the clarification chamber and the irrigation storage so that bacteria numbers are significant reduced from hundreds of thousands to hundreds (that's certainly the aim). Two real problems with surface irrigation include the control of surface ponding from irrigating at a rate greater than the infiltration capacity of the soil and the likely contamination when the irrigation system sprays during rain and runoff is contaminated and enters the wider environment without adequate control. Special wastewater drip irrigation pipe must be used for all sub-surface drip lines. Ordinary irrigation drip line is unsuitable as the inline drippers have not been designed for wastewater which is not as clean as normal irrigation water. Wastewater irrigation line is purple. In the figure to the left, a typical layout of a drip line is shown. Essential are the filter and the return flush line. Two valuable websites for wastewater drip irrigation are: Netafim and Triangle Waterquip. The maximum benefit of irrigation, surface or subsurface, is gained by irrigating an area until the water deficit is met and then allowing the soil to return to a drier state. Field capacity is a term used to describe the moisture content of the soil after it has been saturated and then allow to freely drain, in other words there is no visible water on or in the soil. IOrrigation should bring the soil up to field capacity and then wait until the soil has dried considerably, but not so the plants are under stress. Such an irrigation strategy is difficult in a domestic situation so a sequential irrigation value is used. The sequencing valve opens to one port at a time. When the pump finishes and the pressure drops, a spring returns the port outlet to the next port in the sequence to await the pump starting again. 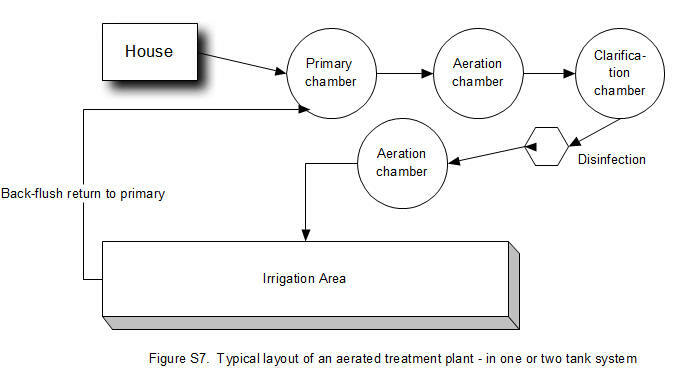 The benefit of this system, as shown in the figure to the left, is that an area is irrigated only once in the sequence and has time to drain before the next cycle. How much water is delivered on each cycle depends upon the setup in the irrigation tank and the volume of water available for pumping.